Surely you’ve heard of the Time Travel Mart. 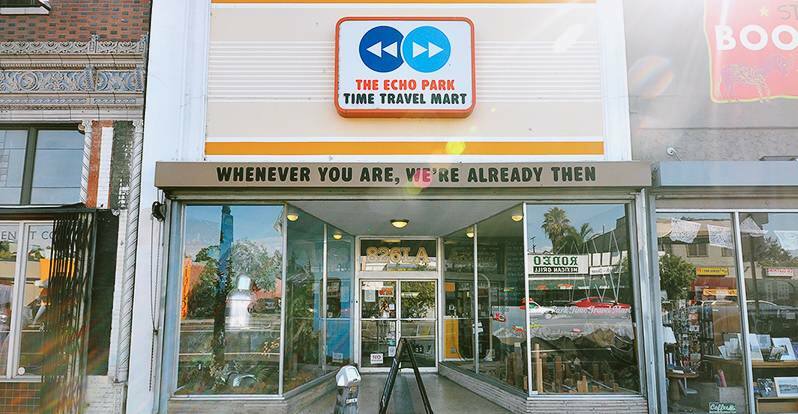 You know, that kitschy L.A. store that sells everyday time traveling essentials such as mammoth chunks, robot milk, and the all-important time travel sickness pills (Doc Brown’s addiction to these is the dirty secret no one ever talks about). But jokes aside, the truth is this isn’t just some hipster excuse for gag gifts, it’s a portal where students can step through and instantly be transported to a world of creative expression and learning. A few weeks back I took a trip to the Echo Park branch of the Time Travel Mart, and the deeper I stepped through the wormhole, the more I realized just what an amazing place I was bearing witness to. And these are the five reasons why. The real magic of the Time Travel Mart is that it’s not just a Time Travel Mart (I mean, how ordinary would that be…) but really a (not so) secret front for one of the leading educational non-profits in the entire city: 826LA. 826LA is the local chapter of a national organization with a mission to provide students with free educational services focused on creative and expository writing skills through one-on-one tutoring. 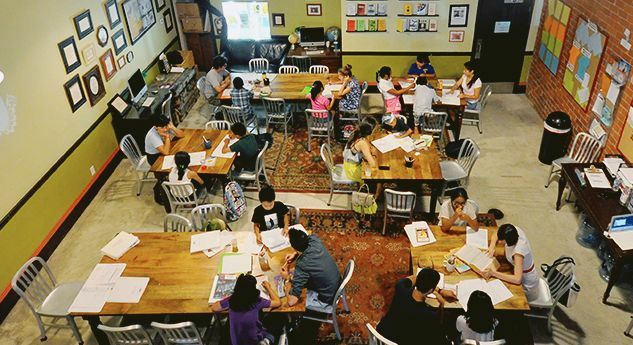 The organization got it’s start on Valencia St. in San Francisco in 2002 where founders Dave Eggers (yup, that author dude) and educator Nínive Calegari conspired to create an educational outlet to provide free writing services for the neighborhood youth. Unfortunately, soon after finding an appropriate space for rent, they realized that zoning laws obligated them to have an operational retail business in order to maintain their lease. Looking around at the ship-like surfaces of the stripped-down space (a former gym) it was decided the most appropriate storefront would be a pirate supply store. The initial challenge of 826 Valencia is now a tradition with each city chapter creating their own unique retail storefront, from Boston’s Big Foot Research Institute to Washington D.C.’s Unnatural History Museum and of course L.A.’s dual Time Travel Mart locations (Mar Vista and Echo Park). The best thing about program is that it really works. 826LA Development Director Carolyn Gan took some time to chat with me and explained the far-reaching effects 826LA has had on the community. For the 2012-2013 school year 826LA offered 359 sessions of after-school tutoring for 240 registered students taught one-on-one by 636 unique volunteers, plus 374 hours of in-school programming. And this doesn’t even account for the myriad of field trips, collaborate book projects, workshops, and college application assistance, with every single hour of service being provided strictly by the volunteer staff. Perhaps most importantly, the parents (who might be the best judges of success) really seem to love it. A survey of student parents from the 2012-2013 826LA annual report showed that 95% of 826LA parents reported improvement of writing skills, 89% reported improved grades, and 95% said that their children felt encouraged to be more creative as a result of 826LA. In a nutshell: something really good is happening here. The rewards aren’t just for the kids either. Some volunteers, like Marysol Valle do it out as a way to give back, helping students who she sees a bit of herself in. Others, such as Ali Pearl, find joy in the relationships they build and the rewarding feeling of a seeing a student grow before their eyes. I spoke with Ali about a young girl named Dayanara Martinez-Lozano who she had been paired up with, and had the pleasure of watching develop over the course of their time together. Although initially a difficult-to-reach student who had to overcome shyness and language barriers, it was clear from the beginning that there was a spark in this young girl’s eyes, and all she needed was a bit of time, patience, and one-on-one attention. You can’t stop time because time flies? Seriously? It makes me wish I could think like a kid again. When you purchase any of the bizarro products on the shelves of a Time Travel Mart the proceeds go directly to supporting the educational program. As someone who takes an active interest in the development of local programs that are making our city a better place to live, I have high hopes that 826LA can keep doing what it’s doing, reaching more and more students and have a long lasting impact on their lives. If you’re interested in supporting the program in a very real (and super fun!) way, 826LA will be celebrating their 10th anniversary with a “Let’s Do the Time Warp” dance party slated for Saturday, Oct. 18th at The Unique Space, 1275 East 6th Street in Los Angeles for which you can get tickets here. 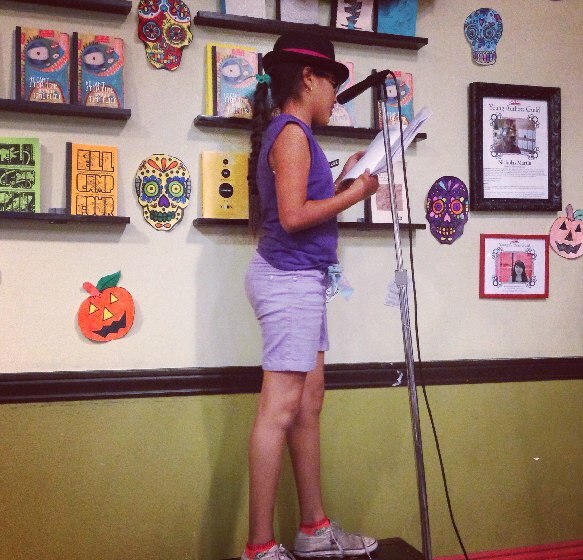 Doors open at 8 p.m. and dancing will ensue from 9 p.m. till midnight, with every dollar raised going to 826LA’s free writing and tutoring programs. And of course, if you can’t make the party but are still interested in volunteering, you can find more information on the 826LA website.